Decked out in terracotta and bamboo, with metal furniture and bright cushions, this bijou place offers authentic charm and wonderful Moroccan food. Lanterns, flickering candlelight, and red kilims pinned to the walls produce an alluring twinkling atmosphere. In fact caf� is a bit of a misnomer: every mouthful of food is testimony to skill in the kitchen. This resilient little gem, set amidst the thronging Americans of Bayswater, is a blink-and-you�ll-miss-it curiosity, painstakingly traditional and tirelessly personable. Forget the gorgeous carpets on the walls and the tunes playing in the background, tempting us back to Morocco. Forget the amazing food and the value for money. Go to Cous Cous for service. Our waitress knew the intricacies of each dish and was more than willing to explain its origins and introduce us to a complete and traditional Moroccan eating experience in London. Go. Now. 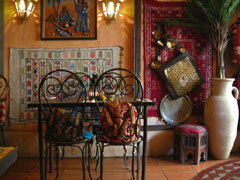 The food sings with skills and is better than most Moroccan restaurants could hope to serve. Service is theatrical, enthusiastic and perfectly professional. This is an exciting little restaurant which has its own flair. We�ve been here a couple of years ago and it seems that only a little has changed. The food and the drinks (esp. the orange flavoured mince tea) are very very good. We hope that the restaurant will be still there on our next trip to London. found ourselves searching for somewhere to eat in the area & liked the look of this little restaurant so decided to try it out - we couldn't have been more delighted! food was very tasty, extremely plentiful & the service was good. couldn't recommend highly enough, only comment would be to question why it was so quite on a Saturday night! The decoration, the food, the atmosphere are gorgeous!. Probably It�s one of my favorite restaurant(first Spanish). Went to this lovely resturent and was shoked how good the food was! I thought that because I was a bit hungry i would just get some thing quickly t eat but i stayed for like 2 hours eating there lovely moroccan dishes i would strongly recomed you going there! as soon as you enter the hot moroccan food in to your food your taste buds roar with joy asking for more and more it is one of the finest resturents ever! I have been to this reaurant so may times , but I don't go anymore and this is because of one reason which is the management. I had the chance to talk to one of thir employees at the time ( outside the restaurant) , she've been complaining that they don't pay her enough money at all , 6 hours shift for �15....Can you imagine?!!! It's slavery!! !They sia to her that they will give her tips after sharing it between them , but they did give her just 4 or 5 pounds a month extra , saying that it's her tips...while when I use to go there , I use to leave �10 tip evrytime and other people in the average... I think it's outrageous. My partner and I go to Moroccan Tagine in W11 on a weekly basis where the atmosphere, prices and atmosphere are all brilliant. For a change as we were in Bayswater we thought of giving Couscous a try - big mistake. It was crammed, the service was non existant(only 1 waiter serving), my lamb kebab was raw and it was horribly overpriced - double what we normally pay. Nothing positive to say about Couscous and would never go back or recommend this cafe. Went to Cous Cous cafe last night, food was lovely but horribly overpriced. As a large group of 12 we were offered a set menu at �25 a head. We were served shared starters and a main course, but there was no way this was �25 of food each. Then when the bill came they tried to charge us for 14 people (the original number for the booking - although this was later changed, but we gave the restaurant plenty of notice). The restaurant owner then tried to shame us into paying for 14 people- an extra �50! I was very disappointed. Indeed excellent and authentic moroccan food from the chick peas pur�e to the Kefta - spicy lamb meatballs. Also you need to try the couscous home made bread, delish and simple. I liked the decor, it is quite cosy and is definitely the right place for a romantic dinner. Service was a bit slow on a busy Thursday nite, apart from that hi-five! I aim to eat in this superb little restaurant every time I come to London. Why? The atmosphere is just fantastic, the food consistently delicious, the manager and his staff are so friendly and welcoming, as well as being attentive and highly knowledgable about all of the dishes on offer. It is an all-round delightful experience that I cannot recommend strongly enough. Go go go!